Spring is in full swing right now with new birds on territory and migrants passing through. One of my favorite things about this time of year is the recently returned birds that make their homes around the nature center. Some species are opportunistic, taking advantage of structures already in place. Other species may need a little coaxing, but it is well worth the effort to invite a new family into the neighborhood. Delaware Nature Society staff and volunteers have been working on habitat improvements at the Morton Farm, a former homesite and farm field, located directly across from the nature center, for the past two years. Every season attracts new attention from the local wildlife and this spring has been no different. Chuck Fullmer, an accomplished nature photographer and Martin landlord, donated three boxes and gourds in March. After a few weeks of flybys, we finally have a few pairs that have been entering the gourds on a regular basis. 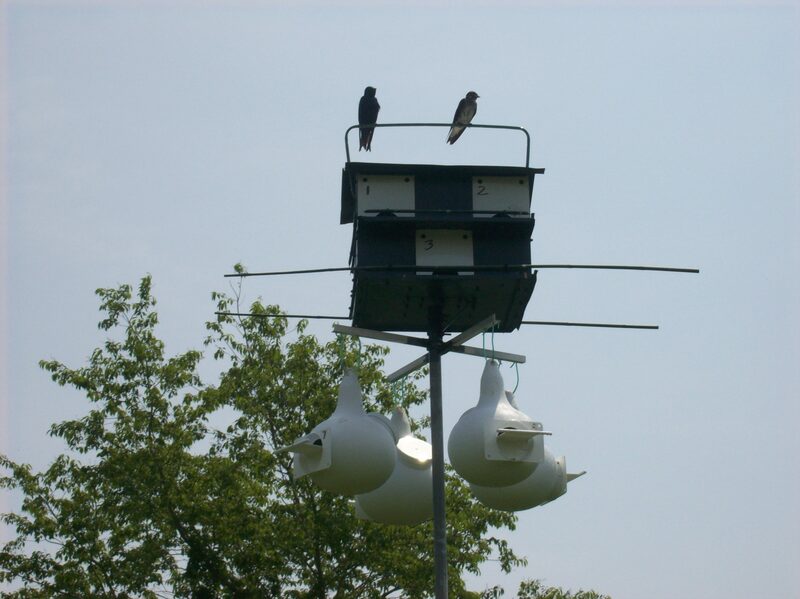 Purple Martin and other colonial swallow species seem to take full advantage of what humans offer. Cliff Swallows utilize bridges, Rough-winged Swallows nest in drain pipes along waterways, and Bank Swallows dig into gravel and sand pits. Barn Swallows will take up residence under porches and eaves – wherever they can find a slight ledge to build their mud nests. 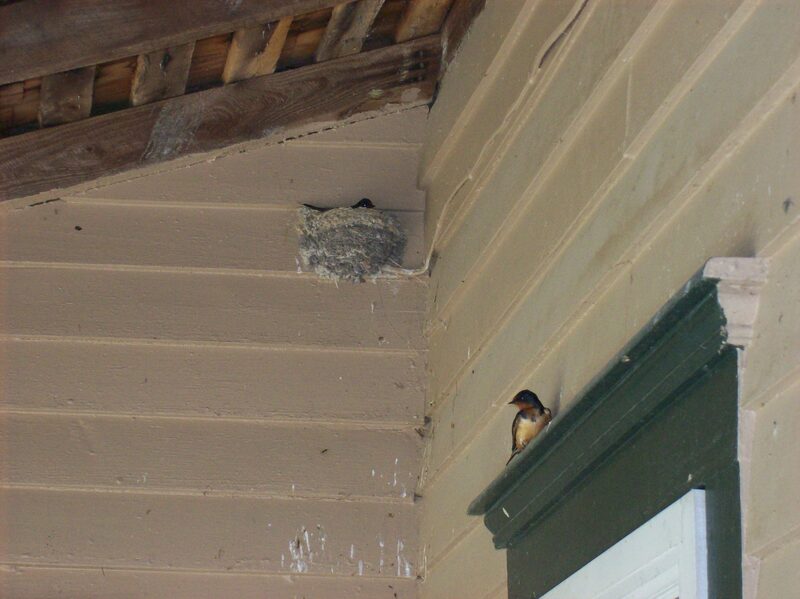 A pair of Barn Swallows nest on this porch every year. Notice the wire on the wall which provided enough "ledge" to build their nest upon. 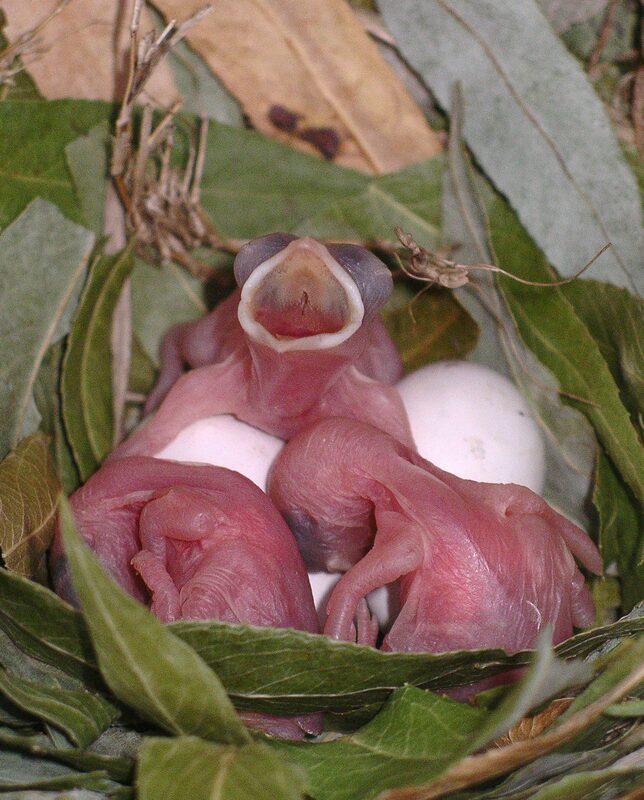 The Eastern Phoebe, a flycatcher species, is much like the Barn Swallow in its nest site choice. They line their nests with moss. 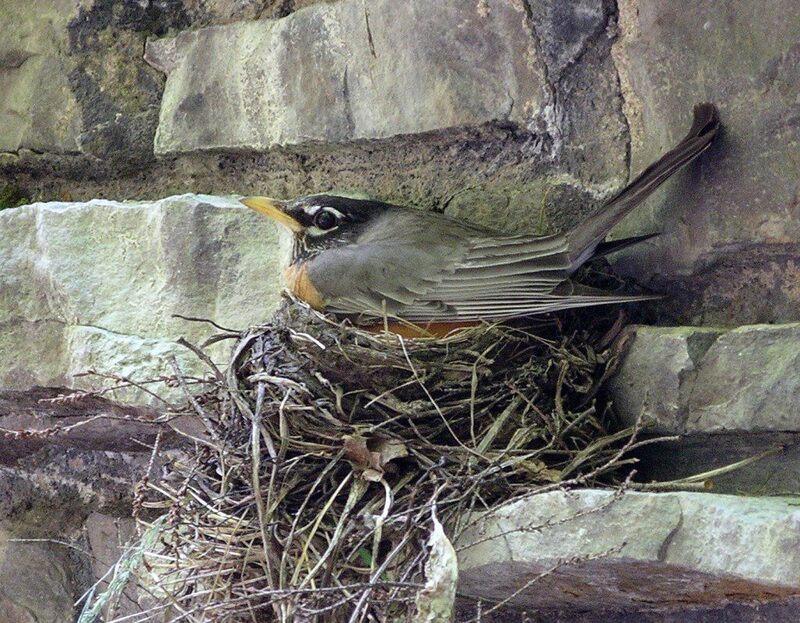 American Robins and Mourning Doves will also use ledges, though they typically nest in trees. Installing a small wooden block under a porch or eave may attract these species right to your house! 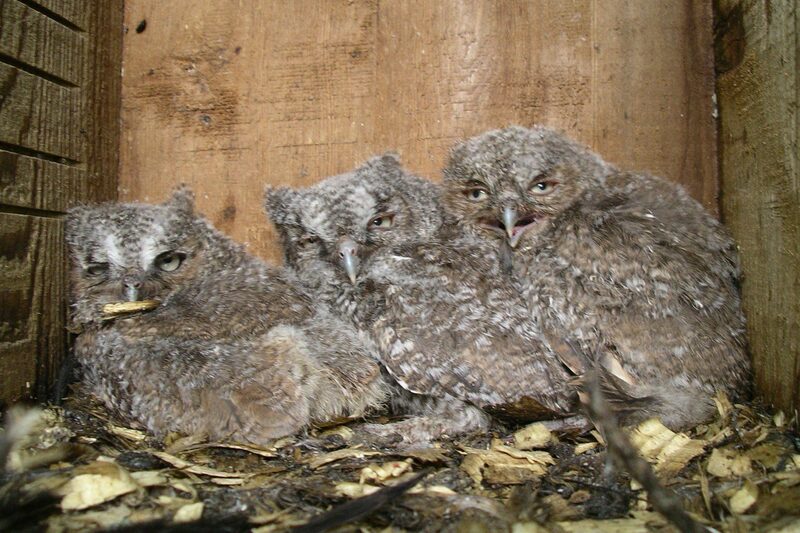 The Birder’s Report features a variety of online nest box plans for you to use. 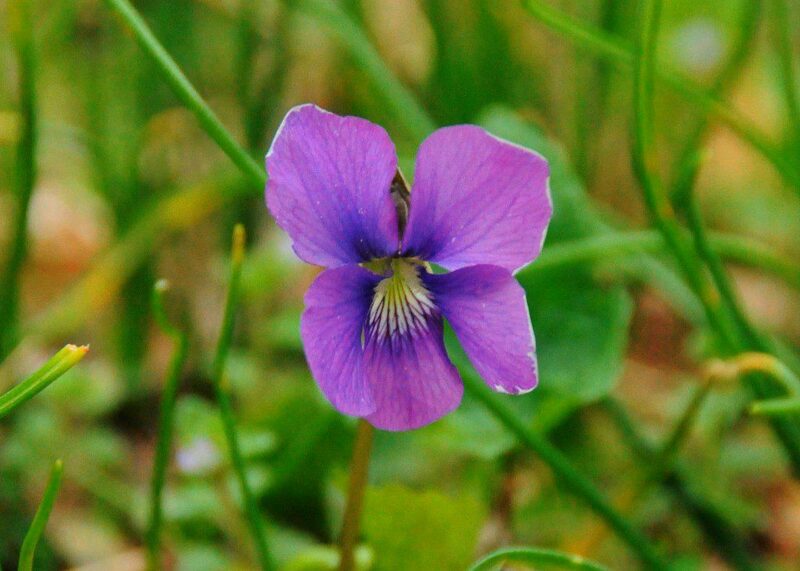 Delaware Nature Society is the local representative of the National Wildlife Federation’s Backyard Wildlife Habitat program which provides a great deal of useful information to make your home wildlife friendly. Have fun!